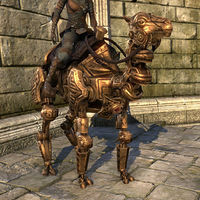 The Dwemer did not rely entirely on mechanical vamidiums for use as mounts. 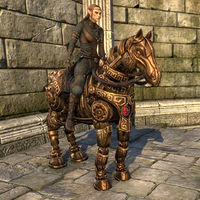 For example, the existence of ancient Dwarven horse armor points to the use of war horses by the Dwemer. Many vamidiums were collected by the Mages Guild and stored in the vaults below the Arcane University in the Second Era. When the forces of Molag Bal overran the Imperial City during the Planemeld of 2E 582, many of these rare artifacts were smuggled out of the city and began to appear on the open market all over Tamriel. 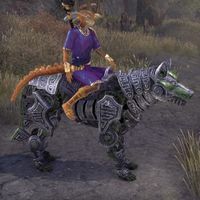 Note that Dwarven vamidiums are not to be confused with fabricants, partially organic mechanical constructs created by Sotha Sil which are also sometimes used as mounts. Dwarven Bears are vamidiums which resemble bears. 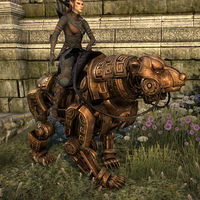 Guylaine Marilie, a noted Dwemer scholar, speculated that Dwarven Bears were reserved only for Dwemer of high rank or status due to their impressive size and intimidating appearance. Dwarven Camels are vamidiums built to resemble camels. They are most often found among the ruins of the desert-dwelling Rourken clan of Hammerfell. 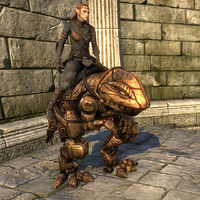 Dwarven Guars are vamidiums which resemble guar. They are most often found at Dwemer sites in Morrowind, as might be expected given the widespread use of guar as pack animals and mounts in that region. 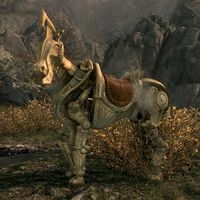 The Dwemer constructed various types of equine automata, more commonly known as Dwarven Horses. 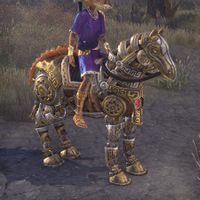 Though usually made of so-called Dwarven Metal, there have been rare examples of vamidiums known as Adamant Dwarven Horses, with parts forged from one of the rarest materials on Nirn, a super-hard whitish alloy known as Dwarven Adamant. 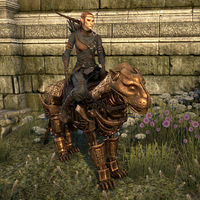 Dwarven Senche are vamidiums which resemble the senche-tigers of southern Tamriel. Scholars of the Dwemer have long wondered why they chose to make animunculi resembling senche-tigers, as Dwemer civilization was restricted mainly to northeast Tamriel, where the only large feline is the sabre cat. Though usually made of so-called Dwarven Metal, there have been rare examples of vamidiums known as Ebon Dwarven Senche, with key mechanical components forged from ebony and ebony-steel alloys. Dwarven Spiders are a common and highly versatile type of animunculi, found in almost every Dwemer ruin. Although often used for combat or repair purposes, large Dwarven Spider vamidiums were also created. Ebon Steel Dwarven Spiders are a rare type of animunculi, highly prized by collectors: a Dwarven Spider vamidium made with a darker Ebon Steel alloy rather than the usual Dwarven Metal, which emits a yellow light. 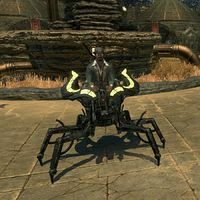 Chroma-Blue Dwarven Spiders are the rarest of all Dwarven Spider vamidiums, powered by gems that emit a cold blue light which is said to reflect the frigid stolen soul of the Dwemer engineer trapped within it. 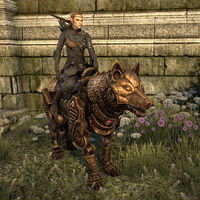 Dwarven Wolves, also known as Lupine Vamidiums, are vamidiums which resemble the large wolves often used as mounts. They are most often found in proximity to Dwemer ruins in northern and western Skyrim, where wolves are most common in the wild. The loping gait of these constructs is said to give the most comfortable ride of any mechanical mount. Though usually made of so-called Dwarven Metal, there have been rare examples of vamidiums known as Vitrine Dwarven Wolves, a silver-colored construct with critical components made of some sort of Dwemeri malachite. Of all the known vamidiums, Vitrine Dwarven Wolves are one of the rarest. This page was last modified on 30 December 2018, at 22:38.